FAQs » Frequently Asked Questions (English) » How can I enable the "Give" links on the Give Site and receive donations online? Notice that the "Give To Designation URL Pattern" must contain the [desig] placeholder. This placeholder will be substituted with the actual designation code/id of the staff/project the donor wants to give to. 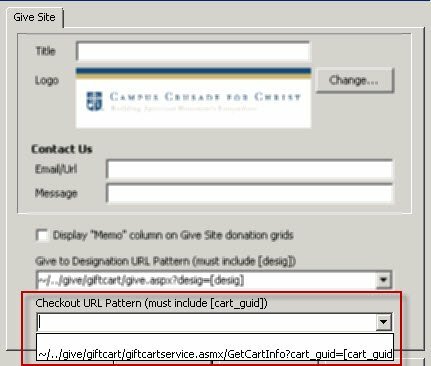 the built-in gift cart (notice the "~/../give/giftcart/give.aspx?desig=[desig]" option). If a merchant service could accept a url that has your organization account and the account of the staff to give to, like: http://myexamplemerchantservice.com?organization=my_organization&staff_number=[desig] then you could enter this in as your "Give To Designation URL Pattern" and you'd be done ... ready to receive donations! Notice that the "Checkout URL Pattern" must contain the [cart_guid] placeholder. 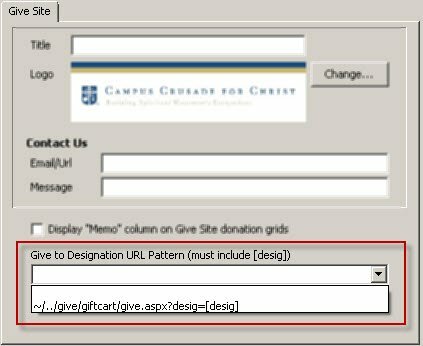 This placeholder will be substituted with the actual gift cart guid of the donor who is trying to pay for the items in their gift cart. There is a demo you can choose ("~/../give/giftcart/giftcartservice.asmx/GetCartInfo?cart_guid=[cart_guid]"). This demonstrates that the gift cart has a web service (demo here). An actual check out provider would be able to query what is all in the user's gift cart by calling this web service with the cart guid. The demo simply shows what an actual checkout provider would call to get information about what's in the user's cart. In other words ... the built-in gift cart has some potential, but it still needs some custom programming to connect the contents of the gift cart with a payment provider.